Professional End of Tenancy Cleaning in Hoddesdon. If you want to receive a price offer or estimate, call our non-stop customer care operators at 020 3746 0000 or online here. Our Hoddesdon EN11 cleaning team will also hoover every floor, wash the windows from the inside, including sills and frames, clean the carpets and hard floors, perform deep kitchen and bathroom cleaning and many more tasks. Along with this specific service, you can also book our removal service to help you move and pack, our handyman service to take care of any repairs, our deep carpet or upholstery cleaning services, if there is a need, and so on. We offer special discounts for customers who book more than one of our services at a time. If you are moving out soon, think about hiring us to ensure that you get your full tenancy bond back. We know how much effort and time cleaning the property you are moving out from takes. This is why, many years ago Thomsons Cleaning Hoddesdon EN11 began offering the specialised end of tenancy cleaning service. At an affordable price the private and commercial customers get a full tenancy cleaning service, which comes with a 48 hour customer satisfaction guarantee. This means that if you or your landlord have complaints, we will come back and re-clean it for free. Our cleaners are all vetted, trained and constantly monitored and assessed for adherence to the implemented quality and safety work procedures, as well as the end of tenancy checklist. The checklist for this expert cleaning service in Hoddesdon EN11 is very detailed and includes a wide range of cleaning tasks which need to be completed, before the cleaning team can go home. 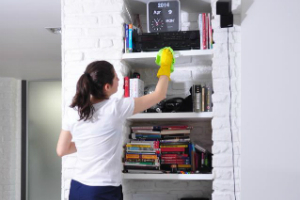 These cleaning tasks include cleaning of: all surfaces, light switches, all woodwork,, door knobs, mirrors, doors, tops of doors, door frames, skirting boards, picture frames, on top of wardrobes, and every single surface in the property. In order to book our end of tenancy cleaning in Hoddesdon EN11, you need to be sure that all your individual belongings have already been moved out of the property. Get in touch with our customer care operators at 020 3746 0000 or via the booking form online. They are available 24/7, so you will be receiving written confirmation within two hours by text message and e-mail. We do not need that you pay a deposit for the booking. The price is fixed, there are no hidden fees. We offer a forty eight hour customer satisfaction guarantee. We are available for same day and emergency booking, as well as on any other day of the year. Book now!